The kitchen is often the hub of the home and possibly the most used room in the whole house, ok the sofa may take a bit of use but not like the kitchen. Kitchens have remained the multi functional beating heart of a home from cooking meals to doing the laundry and in any home the kitchen has to work like a well oiled machine. So with all this use the kitchen inevitably takes a battering, doors break, handles become loose, tiles and paintwork jaded, work tops chipped you name it the kitchen suffers and can easily start to show the scars of battle. Here are 5 ways to upgrade your kitchen. It’s amazing what a simple lick of paint can do for a kitchen, fresh paint on the walls and woodwork can often give your kitchen the lift it needs. Paint with bright kitchen specific paint to achieve the perfect easy to clean finish. Remember as the kitchen is used for cooking so it’s essential to wash the walls down with sugar soap prior to painting to remove any grease and grime. Repair worn fixtures and fittings. Broken hinges and handles can cause you enough hassle to hate your kitchen. There are few things as bad as trying to open a door or drawer only to find it has no handle or worse it simply comes off in your hands. Simple wood glues can often help tighten loose timbers or a few screws in an old hinge or handle can cure those other faults. Replacing the drawer fronts and doors. This may sound like an expensive solution but it’s often more cost-effective than you think. Many kitchen cabinets are still fit for purpose and can be retro fitted with brand new drawer fronts, doors and handles. This quick and convenient solution can be fitted quickly and easily by Arley Cabinets of Wigan – call us today to find out more. The ultimate way to upgrade your kitchen is to invest in a new kitchen. Of course there are many suppliers out there of off the shelf kitchens, at Arley Cabinets we manufacture everything to your exact requirements, this of course ensures your kitchen fits the space exactly. Our team of highly skilled craftsmen ensure every detail is taken care of from start to finish including design, manufacture, installation. 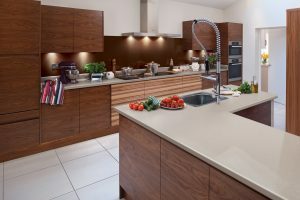 Choose the colours, the woods and the finishes of your brand new kitchen. If you would like your kitchen upgraded call Arley Cabinets of Wigan today for more information, we provide a friendly and low pressure environment, no sales people just friendly staff who’s heart is in great craftsmanship.